For much of the first half City were almost completely in control of proceedings and there were several reasons behind their superiority. One of the main reasons for City’s dominance was down to their ability to build-up in a stable fashion from deep areas. They demonstrated strong collective press resistance and their use of Bravo was a major factor behind this. In deep build-up situations the use of Bravo as an additional defender allowed them to create an instant free man against United’s man-orientations. By doing this they were able to draw United’s forwards into pressing him in turn creating a free man in the defence or midfield line. 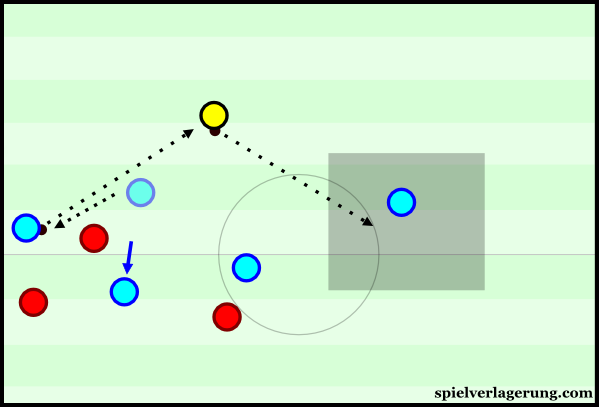 This often allowed them to escape the first line of United’s pressing but there was a deeper and more subtle aspect that allowed them to do this. When United’s forwards left their direct opponent to press Bravo they would often do so from an angle that allowed them to cover passes into said opponent whilst creating access to Bravo. In reaction to this City used blind side movement to escape the cover shadow of United’s presser in front. 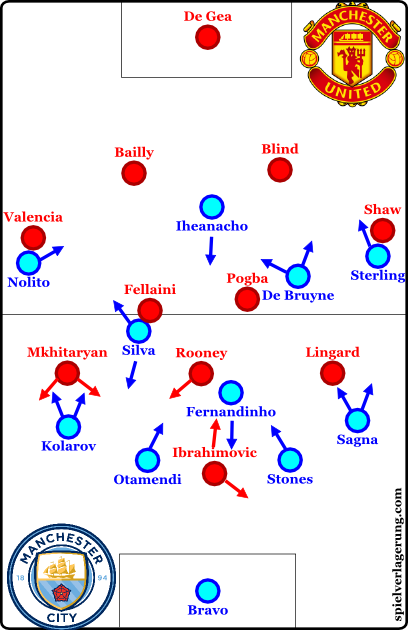 With this movement they could create passing options from situations where United appeared to have good access. Furthermore this blind side movement was effective due to the positioning of the players ahead. Knowing that they were in control of the positioning of United’s midfield pair, Silva and De Bruyne used their positioning well to manipulate United’s pressing structure. When they were able to use their blind side movement to create passing options in the first line Silva and De Bruyne would occupy higher positions which removed Pogba and Fellaini’s capacity to support the press. With weak support from behind United’s forwards were easily taken out of the game and City enjoyed large space behind United’s front line. Bravo as a free man and Fernandinho’s blind side movement. However when United appeared to have good coverage of the passing options in the first two lines Silva would often drop and the reaction of Fellaini would have big implications for the actions of City’s ball carrier. If Silva was followed into deep positions City could play longer towards the forwards to target a defence exposed without the support of the midfield line. This would give the forwards the chance to attack the back line directly if they could control the destiny of the second balls. Alternately if he was not followed Silva would be able to act as a free man and allow City to break past United’s pressing structure. Another area of their build-up that Bravo had a strong influence on was in connecting their possession from wide areas back into the centre. When City appeared to be trapped on the wings without viable passing options they used Bravo as a route to switch the ball back to the opposite half space. In order to maintain coverage of the nearby passing options; United in particular the front two, had to shift over to the ball. In these situations City used Bravo to switch the ball to a centre back in the opposite half space. Due to the long distances they had to make up United could not create access against these half space switches and the recipient could drive forwards aggressively into midfield. This would have a similar effect as the use of Bravo. United’s midfielders were put in situations where they were required to create access to the ball in front of them but also maintain coverage of their direct opponents behind them. At times they did neither and in moving forwards to press they only opened large spaces for their direct opponent to receive passes behind them. In order to make these switches and connect their possession from wide areas back into the half spaces, Fernandinho and the centre backs demonstrated strong staggering. In these situations where the ball was seemingly trapped on the flanks Fernandinho often moved higher into midfield. This was done to drag Rooney forwards with him and reduce United’s presence in the front line which would in turn give the centre backs more time and space on the ball. However this movement was at times done by the centre backs. In some situations the ball-near centre back would pass out to the full back and move forwards, if Ibrahimovic chose to follow then the pass back into Bravo was open. If he did not follow then City would be able to connect their play back into the centre through the ball-near centre back. These simple movements were done with the intentions of maximising the potential passing options for each receiver which was particularly important to prevent them being trapped in wide areas. With Stones, Fernandinho and Otamendi making slight movements to occupy different positions and Bravo in deeper areas offering an easy route to make switches, City were able to make connections when they seemed to be trapped. This was particularly important and advantageous against a United defence that struggled to create access upon these switches, particularly in the half spaces. Despite their dominance Manchester City were not able to break through United’s defence regularly and were not able to create several chances. Part of the reason for this was their intentions, they made rather sporadic attempts to break through and seemed to be quite focused on building stability with their possession. Furthermore they often lacked depth particularly when Iheanacho dropped deeper. Although his position was usually taken up by Silva, his skill set did not facilitate creating a threat in behind. Furthermore the timing of the reactions from Nolito and Sterling was sub optimal. At times they reacted by moving higher, more central and at times making runs in behind but these were often made too early or not at all. Despite the strength and press resistance the away side showed there were some clear issues in United’s pressing that made City’s life easier. Firstly they lacked a certain intensity in their actions and it was at times too easy for City to break past them with individual dribbles. This lack of intensity transferred to shifting moments where they were often too slow to prevent City from escaping their pressing by switching to the far side. Mourinho’s men also experienced issues in pressing particularly on their right side. When City were building in the left half space Mkhitaryan was visibly unsure whether to close down aggressively due to the risk of leaving Valencia against Kolarov and Nolito. He therefore chose to approach gradually whilst attempting to cover the pass into Kolarov. However Otamendi used his time on the ball to drive forwards with the ball where Nolito could move infield and receive passes, De Bruyne could move off Fellaini’s blind side or Silva could be accessed. Another issues was due to the man-oriented nature of their defending. Whilst their man-orientations allowed them to press every pass, the individualistic nature prevented them from making cohesive and collective attempts to press the ball. With each defender being at least slightly occupied with a direct opponent they were often unable to lend each other adequate defensive support. At times this exposed the likes of Fellaini and Pogba to the individual qualities of Silva and De Bruyne in particular who was able to create havoc with his strong blind side movement. With this man-oriented nature, United experienced some compactness issues as their reactive nature was capitalised on through intelligent movement from Guardiola’s men. One area this was particularly evident in was the lack of support from the midfield in pressing. De Bruyne and Silva at times dragged Pogba and Fellaini into deep positions simply by remaining advanced which created large vertical disconnects in United’s pressing. 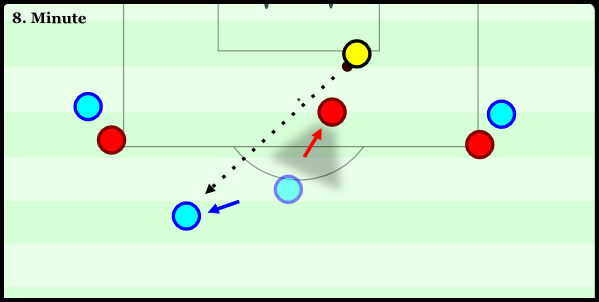 This was also used in the opposite way, with the opening goal being an example of this. With Silva dropping into a deep position and Fellaini following cautiously, United lacked his aerial presence in front of the defence to defend against Kolarov’s long ball. When United recovered the ball in deep areas their man-oriented nature meant they lacked separation from their opponents to make passes and avoid City’s counter pressing. Thus they were easily forced into hasty clearances which partly explains their low possession rate for much of the first half. In other situations where they recovered the ball in midfield areas they were unable to combine out of pressure with City’s focus on guarding passing lanes before moving into them leading to a number of interceptions. In non-transitional phases they were often reluctant to build-up from deep areas with Mourinho citing after the game his wariness of City’s desire to press. On the occasions that they attempted to build attacks from deep they experienced issues with poor support from the midfield. This was mainly an issue stemming from a poor dynamic in the midfield. In some instances Fellaini and Pogba were simply too static and were thus easily covered with simple man-orientations. On other occasions the dynamic was simply not co-ordinated with the pair moving into high and wide positions where they could not be accessed with short passes. However it is important to note that this was possibly an instruction from Mourinho to bypass City’s pressing with direct balls. Furthermore press resistance is not one of Fellaini’s finest qualities and his selection at the base of midfield was not conducive to a short build-up. Towards the end of the first half they built a foothold in the game and took advantage of the lowered height and intensity of City’s pressing. An error from Stones and Bravo allowed them to claw one back and set up an interesting 2nd half. Immediately after half time Mourinho brought on Rashford and Herrera for Lingard and Mkhitaryan as United switched to something of a 4-3-3. With Herrera now behind them, Pogba and Fellaini in particular could move high and use their height as targets for long balls. Their final 3rd dynamic was very wing-oriented as they aimed to take advantage of their height advantage with crosses. While United’s right side was rather predictable with Rooney and Valencia aiming to cross whenever they had the chance, the direct dribbling of Rashford on the left was more problematic. The direct approach did generate quite a few shots meaning City had more goal kick situations where United could force them to play longer with their man-oriented approach. Due to the rules of a goal kick Bravo could not be used as a free man and the coverage of all passes in the first line meant they were forced into longer kicks from these situations. Generally United’s direct approach failed to create quality chances and this was partly due to a smart change from Guardiola. After around 7 minutes of the second half when United’s approach was evident Guardiola brought on Fernando to the 6 position with Fernandinho acting as an 8 and De Bruyne moving up front. In addition to the increased height Fernando brought he often dropped into the defensive line to protect against both long balls and crosses and City defended in a 5-4-1. With three centre backs they had more security against flick ons and the full backs could press more aggressively in wide areas to prevent crosses. This would assist in reducing the frequency and quality of crosses. With their opponents becoming increasingly desperate City had a number of transition situations which they split between winding down the clock with possession or going directly for goal. Their profligacy prevented them from adding to their lead and making the last few minutes more comfortable. 8 wins from 17 games and still just the 3 defeats is now the record as Guardiola kept up his dominance in meetings with Jose Mourinho. Although there is a long season ahead, victory at Old Trafford without Aguero and Gundogan should give City’s fans confidence. Klopp’s Liverpool and Conte’s Chelsea will likely be tougher opponents from a strategic perspective and it will be interesting to see how City deal with those opponents. As for United, Mourinho’s strategy will be strong enough to beat most opponents in the league. However their attempts to press City were not intense or co-ordinated enough and this will need to be improved for their February clash at the Etihad. You answered many of my questions regarding why manutd lost the match and how city managed keeping possession. But why is pogba not making much of an impact? I believe it’s because of his lack of discipline on the pitch. He was not part of the build-up because higher up the pitch when his team had the ball and also forgot to come back and help Fellaini whenever needed, mostly leaving Fellaini alone, facing 3-4 city players. I still believe Mourinho is not making a very good use of him in a 4-2-3-1. He expresses himself much better in a 4-3-3 with a holding midfielder covering up for him. Pogba is an quite unfinished player with an extraordinary Skillset. I don’t think it’s possible to let every facet of his skills shine – he shares some similarities with Rooney here, who can play as a worldclass finisher or a Box-to-Box-midfielder and everything inbetween. Both together are difficult to balance, because both lack a little pace and their presence isn’t strong enough to play them as a double-8. I would go for a 3-4-2-1/4-3-3 Hybrid http://lineupbuilder.com/?sk=cx2v2 a little like BVB played in spring. Rooney and Pogba gain a lot of freedom to roam whilst Mkhi and Shaw provide width. Martial fits that style better than Zlatan because he’s faster and more versatile in his movements. I think it’s near impossible to implement Zlatan, Rooney and Pogba into one team, because they’re all very centrally focussed and share some (too many) strengths and weaknesses. We will never see this but it’d be my take on that weirdly gathered squad. lets see… think pogba played really strong when used as a receiver of difficult balls when man marked, holding the ball and continuing the attack with a dribble or passing. but that again is something zlatan does when he drops back into midfield. think it will be crucial that zlatan, in this squad, stops dropping into midfield. then i would suggest rooney as classical play maker (lacking some classical play maker qualities, but he could compensate with his other qualities), pogba as catalysator on the break and zlatan in “the classical 9”. that would still leave a lot of dirty laundry to all the other teammates, but, hey, theres bbc functioning so why not… RIP? What do you mean with “classical playmaker”? Do you mean a No. 10 or a deeper role? Rooney shouldn’t have his starting position too deep, because his presence is somewhat inconstant in these zones and he definitely lacks playmaking skills from deep. Pogba should also be used further up, because he likes to make these totally unconventional/chaotic dribbles that are dangerous in deep areas but highly advantageous on the edge if the final third. RIP won’t truly function because all three are only capable of playing central roles, none of them is really suitable as a winger. BBC (and MSN) neither have players like Pogba. RIP lacks speed and balance but is stronger in defense. Fielding three centrally focused players relatively high up the pitch only works if there is good positioning and ballcirculation in deeper (and medium high) areas or a brutal focus on long balls and counterpressing. exactly, i would like rooney to play deeper and pogba almost as a second striker with him and ibra switching roles, one dropping, the other not. they could make up a very unpredictable pair. rip as a vertical axis surely doesnt work neither would a bbc/msn like winger-central player-winger solution. so i would go for something 4-4-2-like with pogba and ibra upfront. as i said that still would mean a lot of dirty work for the teammates, but it may mean a lot of work for the opponent as well. Thank you for that. I really enjoyed watching Bravo, a goalkeeper, play football and yet the English mainstream media and the majority of fans who hold their views as gospel had nothing but disdain for a masterclass in possession football. Your analysis articulates my instinct and I can’t thank you enough because sometimes I think I’m going insane…. As an English football fan, I share your frustrations. Plenty of “He can play with his feet, but he’s no good if he can’t catch the ball!”. It was a simple break down in communication between Stones and Bravo, it was to be expected giving the limited training time they’ve had together. Lots of rash judgements as they feel the need to criticise the ‘keeper and coach that ousted Joe Hart.